Whether you’re looking for a large space for a big corporate event, a conference center, smaller venues with party rooms, restaurants that offers private room rental, or other unique options for San Diego event venues, we’ve got you covered! Obviously the type of venue you choose will depend on your needs, as some venues may work better for a larger corporate event, while other venues may work better as a smaller San Diego meeting space for intimate luncheons or a team-building brunch. Whatever your needs may be, the city doesn’t disappoint. The Point is a unique corporate event venue that boasts a 2500 sqft event room with all of the bells and whistles you might expect, as well as beautiful ocean views of Mission Bay. They offer seating with both indoor and outdoor areas, meeting room rentals, and supremely helpful staff. If you don’t expect much over 100 people to attend your event, this location may well be a perfect meeting space venue. Revel Revel is an event space located in the heart of downtown San Diego and boasts sweeping city views. 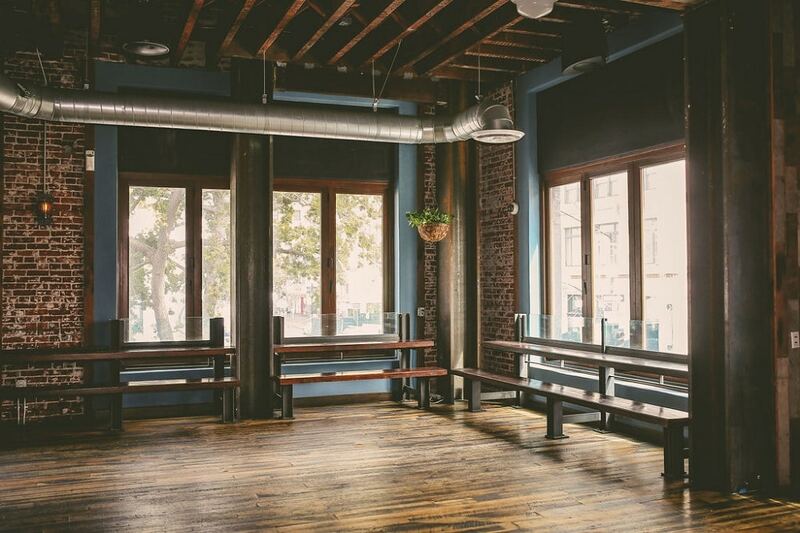 The venue has high ceilinngs, exposed brick, wood floors, and moveable walls making it versatile for any event needs. From wedding receptions and rehearsal dinners to corporate events and private parties, Revel Revel is sure to be the perfect fit. 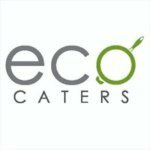 Plus, there are organic catering menus for each event so you can rest assured knowing your guests will also be receiving high quality and delicious bites. This stylish event location isn’t your typical hotel convention center. It’s really more for smaller gatherings of 100 people or less, but makes a great San Diego meeting space for company afterparties or smaller workshops, or perhaps a small business luncheon or brunch. Tech companies may really love and enjoy this one, as well as businesses in the fashion or entertainment industry. Lot 8 is an outdoor event space located in Mission Valley. It’s open, customizable, and exudes all the California vibes. With palm trees overhead, fresh air breezing through, and a blank canvas innside, this venue is a no brainer for a unique and fun warm weather event. From weddings to professional gatherings and special events, lot 8 is sure to delight your guests while staying easy on your wallet! This is a charming event location that can accommodate a smaller, 30 person gathering, all the way up to a 600 person gala or corporate event. Originally a historical theatre, the venue has been transformed into a sought-after location for everything from charity galas and business meetings, to launch parties and more. The Observatory can be found nestled in the heart of North Park and offers a unique experience for everyone. If you’re looking for a meeting space in San Diego loaded with possibility, this is the one. The venue is 50,000 sqft with 3 floors, and it’s perfect for larger groups of up to 1000. You can host a company meeting, a corporate fundraiser, or a holiday party. The coolest part is that by booking the Museum, you’re also helping to support innovative and creative art and programming for San Diego’s children and families. For a more conventional corporate meeting space, Hard Rock Hotel is the place to be with plenty of rock and roll style to make it fun and unforgettable. Located in Downtown San Diego, the hotel has over 40,000 sqft of meeting space of varying sizes and can comfortably host up to 1000 guests. They boast both indoor and outdoor meeting areas and offer ideal solutions for large corporate meetings down to small, intimate business soirees. An outdoor corporate event venue located in the Rancho Valencia Resort and Spa, it’s perfect for a corporate lunch gathering or a business lawn party, with beautiful views of the casitas and garden. Rancho Valencia has other meeting spaces with amenities that can accommodate various sized groups of people, depending on your needs, including a board room with high-beamed ceilings and its own private patio, perfect for 18 people or less. This venue is versatile and can be booked for smaller corporate events, business brunches or luncheons, and smaller gatherings like workshops or seminars. It can comfortably hold 220 people seated, or 400 standing room only. The Lodge at Torrey Pines has a lived-in vibe with beautiful panoramic views of the Pacific. The design of The Lodge is intended to blend in with the Torrey Pines State Reserve and the Torrey Pine trees that can be found there, making it a picturesque venue for meetings and events of all themes and colors. 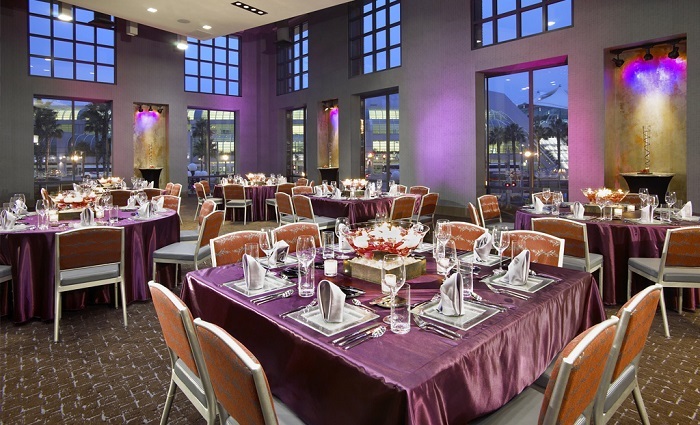 The Hotel Indigo offers a flexible variety of different meeting and event spaces to suit your needs. 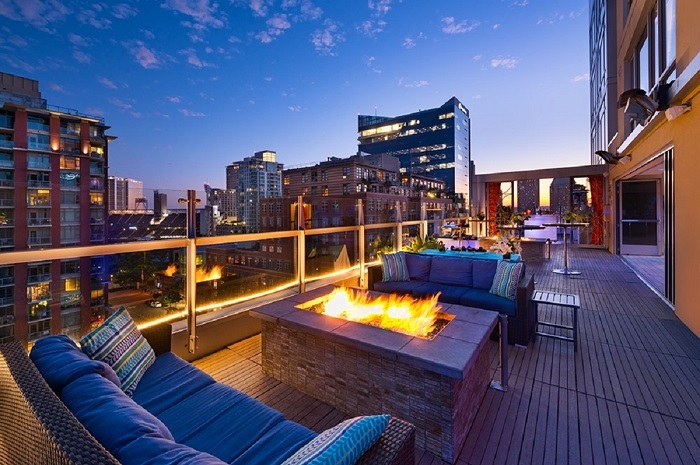 A fan favorite is the Level 9 Rooftop Bar that overlooks Petco Park and is able to serve up to 185 guests in a reception-style, cocktail party setting with outdoor fire pits and plenty of ambiance. They also offer the Fibonacci rooms, the Table 509 Bar and Kitchen, and the Nautilus Room for business meetings and corporate gatherings of varying sizes. No matter what your needs are, whether you want to host a large corporate event or a smaller lunch or brunch, there is meeting place in San Diego that can provide all of the desired amenities, while also fitting the bill perfectly.